Most of the time frames don't interest me. 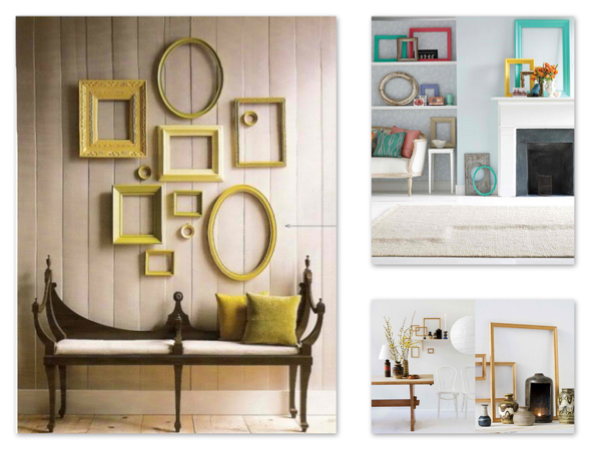 I'd opt to spend my dollars on a few more inches of canvas over a custom frame any day. However, since the last time I tore my studio apart to redecorate I've had a serious issue with things looking too match-y. I gave away all of my studio samples and ordered canvas of every dimention and width and mixed and matched it all with vintage recycled frames. Somehow my typical OCD disappeared and it felt better to see things so un-perfect. These frames inspire me (even though they're not filled with images) to create wall collages that are less-than-perfectly measured at the same latitude and longetude.